Digital aerial images provide multi-scale, multi-temporal, and multi-spectral properties thus production of the images becomes a main trend in the field of GIS and photogrammetry. Geo-referenced or rectified aerial photo image maps are getting important due to its low cost and fast production. Recent spatial information of fast changing environments is crucial for several administrative, planning, observation and assessment reasons. In many developing countries, recent aerial photos with detailed ground resolution of their environments is sometimes problematic or even impossible to access for non official or non administrative purposes as well as international cooperation projects. Several aerial photos missions have been carried out by contracted international remote sensing companies funded by different international grants and loans in most countries. However, most of this spatial data is collected in some ministries while a transparent and controlled access or exchange to remote sensing data, even among different ministries is often not yet established. In contrast, Interpretation of these high resolution remote sensing data is necessary in the field of land use classification, degradation assessments, urban and infrastructure planning as well as monitoring of rapid land cover changes in any kind of environment. Digital high resolution imagery together with up to date computing power now at nearly on everyone’s disposal, even in developing countries, has provided a change in scale with more detailed information being sought through the means of digital image analysis. For example, it is noticed that highly sophisticated and expensive analog devices are no longer required in photogrammetry if amateur digital camera devices are connected with GPS and GIS image enhancements and geo-rectification techniques. This results in an image accuracy of approximatly 0.7 - 1.5 m and a ground resolution of 0.4 to 0.8 m per pixel, depending on platform altitude. Currently several remarkable attempts in balloon born amateur digital photogrammetry have been applied during the last five years. Since two years this technology has been applied in a number of projects on different scale levels in Cambodia in urban as well as rural areas. The production of amateur aerial photographs is a highly efficient aerial balloon photo technique, which makes them affordable at a price of 0.10 – 0.35 US cents per hectare, even for low budget projects in developing countries. In most cases mosaic images were produced based on several single pictures using standard remote sensing mosaic production techniques. Firstly, an atmospheric correction had to be carried out, a step which can be skipped in low altitudes. Secondly, images were enhanced before mosaicing. Geo-referenced digital images are transformed to the local co-ordinate system, by warping the digital images to fit either to a base map or other ortho-images. Ortho-rectified pictures are processed and shifted to an air triangulation model using the method of surveyed ground control points. Ortho-rectified photos based on digital elevation model techniques are considered to offer higher applicable precision as the accuracy level of simple handheld GPS. Using two GPS with post processing an accuracy rate of less then 1.0 m can be achieved. There are significant benefits in ortho-rectified photography over simple geo-rectified images used here, but there are also significant variations in cost. Ortho-rectified photography has the potential to be more accurate while the photographic image is draped over a digital terrain model based on land survey control. The main benefits are of improved accuracy in horizontal as well as vertical plan shape, particularly where there is high relief across the area. But this accuracy again is strongly dependant upon the accuracy of the DTM used as base model. The most accurate acquirable DTM for Cambodia is the SRTM 50 m grid with provides high spatial resolution with a grid of interpolated levels at 1m intervals. Unfortunately, it has got some significant miscalculations in huge flat lowland areas like the Cambodian floodplain or the Tonle Sap Lake and its tributaries. Only photogrammetrically derived detailed DTM or air triangulation models would provide higher precision and better resolution. This may allow orthophotos to be produced with a plan position accuracy of approx. +/-1m, but was not applied due to limited data processing capacity, which is much more cost effective and requires higher statistical and remote sensing software capacities. Geo-referenced digital images are transformed to the local co-ordinate system, by warping the digital images to fit either to a base map or other ortho-images. Ortho-rectified pictures are processed and shifted to an air triangulation model using the method of surveyed ground control points. For real ortho recitfied images require a fully calibrated camera, which costs about five times more than a non-professional one. Ortho-rectified photos based on digital elevation model techniques are considered to offer higher applicable precision as the accuracy level of simple handheld Garmin GPS 76 can only be improved up to +/- 2m applying post processing differential GPS measurements. There are significant benefits in ortho-rectified photography over simple geo-rectified images used here, but there are also significant variations in cost. Ortho-rectified photography has the potential to be more accurate while the photographic image is draped over a digital terrain model based on land survey control. The main benefits are of improved accuracy in horizontal as well as vertical plan shape, particularly where there is high relief across the area. But this accuracy again is strongly dependant upon the accuracy of the DTM used as base model. 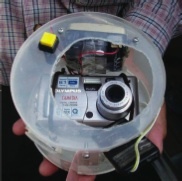 A non calibrated simple 7 megapixel (or better) digital camera is fixed in a light plastic holder together with the infrared remote control and a GPS receiver. The camera is activated by a special electronic clock and is set to take pictures every 10 seconds synchronized with a GPS receiver (see Photo 1). Resulting pictures will have a ground resolution below 1m up to 5-10cm. Balloon levels of 50 to 400 m above ground with different resulting ground resolution are possible with decreasing positioning accuracy of picture nadir points in higher altitudes. The estimated price of the complete photo acquisition bundle add together around 2500 US$ including camera and GPS receiver. Problematic are the balloon sensitivity to wind speed over 3m/sec and explosive inflation gas. For photo orientation and precise image mosaics ground control points have been measured using post processing differential GPS in comparison to simple hand held GPS measurement. Additionally, a combination of Ground Control Points in combination with image to image rectification technique based on a geo referenced Spot satellite image is considered to provide relative accuracy below average handheld GPS errors. Overlapping aerial photos with 30-40% stereoscopic zones along transects are taken across the target area using a non calibrated digital camera at a high image resolution of around 3000 x 4000 pixels or better. With a flight altitude of 500-1200m this translates to a ground resolution of about 40 x 40 cm or even 10 x 10 cm per pixel or about 5 to 25 times the resolution of a typical Spot image or aerial photo. The resulting image nadir points (the point of the celestial sphere directly under the place where ballon is placed) are corrected with calculated image centers beforehand using the positioning data from GPS receivers and a calculation of real image nadir points and calculated GCPs based on topographical maps of 1:50.000 scale. Plan position accuracy achieved varies according to the variability of ground surface elevation, altitude and the tilt of the camera holder during photography. Plan position is usually found to lie within 2-3m with raw images but, with full rectification, the expected accuracy ranges in between 0,2m to 0,5m in horizontal distance to the topographical reference. Photo files are converted from the Camera TIFF format into World-TIFF format using a six to ten parameter transformation (geo-referencing and rubber-sheeting) followed by re-sampling of the image using raster image processing software. Photo geo-referencing rotates and stretches images to match the balloon nadir position, corrects further positioning errors and minimises image distortions. A first order transformation will allow the unregistered image to be rotated, shifted, or scaled, but will not deform the image to best match the links. The second order polynomial transformation allows some distortion of the unregistered image, and should be used if the unregistered image does not quite align with the existing registered map. A third order polynomial transformation is only applied to maximum distortion, or “rubber sheeting”, of the unregistered image to match the ground control points. This is necessary for images with larger deformation and where ground control point links are poorly aligned after rotation. The majority of balloon images where transformed and re-sampled with 25 to 40 ground control points and a third order transformation method. Transformed and geo-referenced images are then joined into mosaics and ready to be used in further interpretation, mapping and classification processes (see Figure 2 and 3). Mosaic tiles produced in TIFF files, have been found to produce the most versatile images for manipulation within GIS. During mosaic joining cloud areas are masked or extracted and substituted with overlapping areas of neighbouring images. Geo-referenced aerial balloon pictures can be viewed or plotted within a GIS, at scales of 1:5000 to 1:10.000 without any significant loss of image quality. Although a higher level of urban architecture plan shape accuracy can be achieved by mapping from even higher resolutions, the resulting image quality exceeds existing and available conventional aerial photos. Pictures could be even used to count the number of umbrellas of temporary market sellers around market areas. Especially in remote open forest regions the achieved data quality offers new opportunities for inventories and detailed degradation studies. Final image re-sampling and map production or on screen digitizing. This photo-scale appears to be optimal, for production of geo-rectified images for use in urban and regional planning as well as environmental observations. It produces reliable plan shape data and horizontal resolution for analytical remote sensing data interpretation and on screen digitizing for operational purposes. Even though detailed vegetation or environmental change detection based upon this method is limited, this accuracy is acceptable at all levels of urban planning and change detection of any kind of construction in the urban environment like spontaneous settlements as well as informal construction. Therefore, it is an appropriate technology for urban planning and construction verification in cities with small to limited budgets.